Forward head posture correction exercises are key when it comes to preventing premature spinal aging. The latest research on normal placement of the upright spine reveals the importance of head position in relationship to your body. It is of extreme importance that the position of the cervical spine allow for your head to sit back atop of your shoulders. Sadly, the effects of gravity, poor posture, the weight of the head, or past trauma will cause neck and skull misplacement leading to something called “Forward Head” posture, meaning the forward displacement of the head where your chin is out in front of your shoulders and chest that causes pathological tension on the spinal cord and brain stem. This can lead to a variety of debilitating conditions which are completely preventable. Forward head posture correction exercises combines with specific corrective chiropractic care when done rhythmically can help to slow down and even reverse this process. 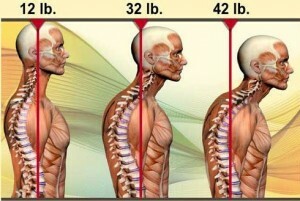 The head in forward posture can add up to 42 pounds of abnormal leverage on the neck. Forward head posture results in loss of vital lung capacity by as much as 30 percent! Loss of lung capacity leads to heart and blood vascular problems. Forward head posture causes an increase in discomfort and pain in the neck and shoulders. Eventually the entire body becomes rigid as the range of motion lessens. Soon, one becomes hunched/slouched. Such care can only be offered by highly trained chiropractors. Remember, standard manipulation and physical therapy will not resolve forward head posture, and neither will taking medications or having surgery for the resulting effects of this condition. Seek out chiropractors who are able to measure the degree of forward head posture and provide a care plan designed to correct it. The problem and the correction of the problem can be measured through postural evaluation as well as a re-x-ray.